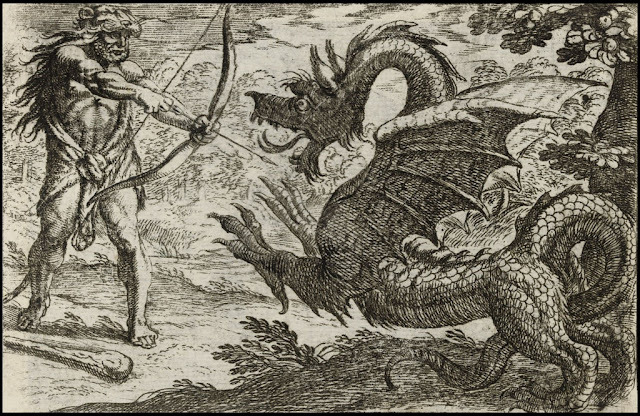 What if dragons are just manifestations of place? They're born from the very essence of the location - the genius loci, appearing from the fog, the rock, the sand or the snow. Manifestations of place aren't readily 'beatable'. You can't defeat the ground you walk on or the air you breathe. Dragonslayers are puffed up braggards attempting to attain legendary status through tall tales. Ancient dragons take on the form of their place - red dragons become crusty with igneous rock, black grow willows from their necks. 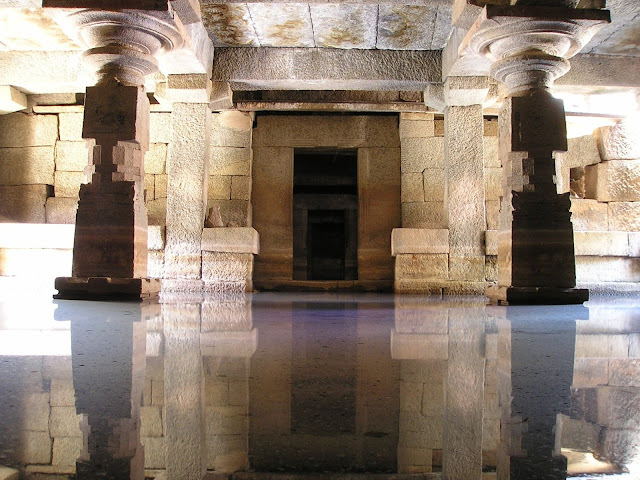 Eventually the oldest become the place itself, yet remaining sentient and all-knowing. Botanists in Trollworld aren't really related to the real world profession. Sure, they still work with plants and they know all the Latin (well, not Latin per se - Troll, actually) names for them. Botanists tend to raise plants to help them hunt for treasure in the depths of the world. They use plants as ropes, lights, lockpicks and even weapons. Botanists can choose to have plant armour covering their body. When they wear no armour, the plant armour wraps around them giving 6 armour. Increase this armour by 1 every two levels. - Become a grappling hook to save you from falling. Roll a SR-CHA with a level equivalent to the number of feet you will fall divided by 10- if successful you are saved and lowered harmlessly. - Become a 3d6 melee weapon. - Create a flower that glows up to 50ft. 1. A swirling yellow portal taking you to the next room, but all you armour is removed, becomes sentient and attacks. 2. A face on the door that must be kissed by good aligned PCs to open. 3. A door of rancid ogre flesh with a bone handle. 4. A sentient door that must be put to sleep to relax its lock and open. 5. A door with a mouth that must be fed fresh meat every hour otherwise it calls an alarm in another room/level. 6. A door you must make laugh to open (in reality, make the GM laugh). 9. A huge dead toad that contains a staircase beneath it's tongue. 10. A door with six knockers that must be 'played' in order to perform the wizard's favourite song. 11. A door that was once a witch. Entering through it curses the first person to vomit for 1d4 hours. 12. The word DOOR written vertically in chalk sure enough opens somehow. 13. A door of suspended acid that must be neutralised with alkali. 14. A sentient door that must reveal a PC secret in order to unlock. 15. A door that if opened outside reduces Dex to 2. If opened inside Dex is boosted by 5 for an hour. This affliction was called St Vitus’ dance. 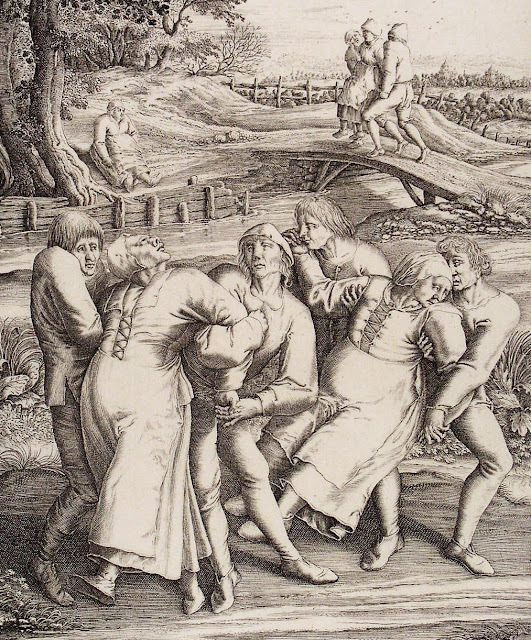 Often a dancing plague begins in the throes of jubilant celebration. Groups of revellers dance, music plays and jesters slake their thirst with warm ale. But the dance takes a hold - the kinetic energy increases and refuses to let up. 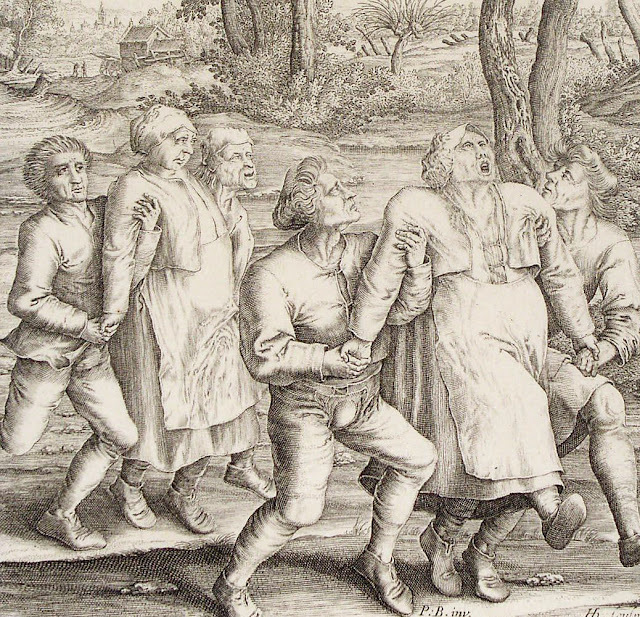 Soon spectators are joining in, a crowd of gyrating peasants writhe, hop and clap their way around town. They can go on for days with no food, finally collapsing due to exhaustion. The clerics blame it on overheated blood. Some chime in, offering a cure - to dance the plague away. Soon halls are cleared out and makeshift dancefloors created to lure in the revellers. Musicians are paid to keep playing. Don't stop - the demons will remain of you stop. Of course, the dancing plague continues. Only a blessing from a divine fountain can cure it, showered on the crowd. 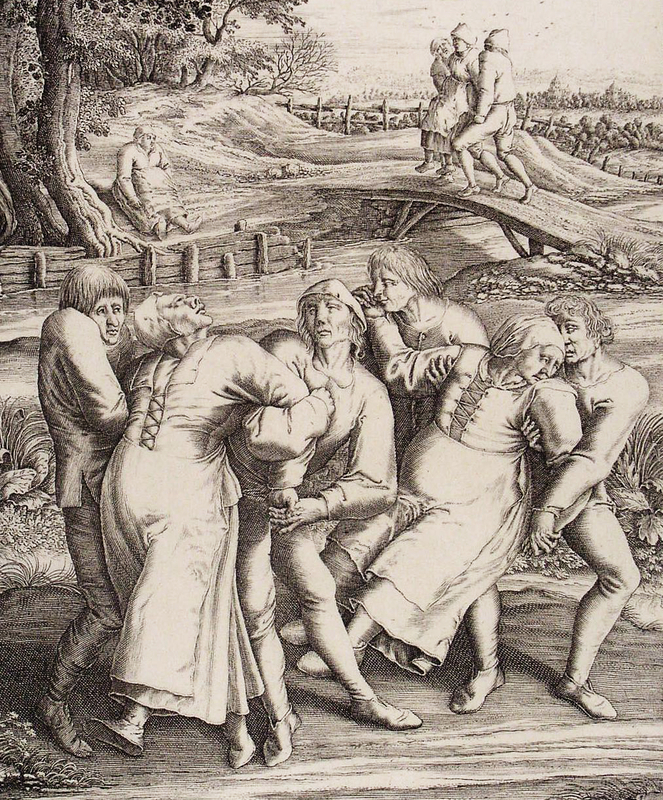 Those who contract the plague will dance for 1d6+1 days and nights, with a 10% cumulative chance of death for every day danced. Despite Tunnels and Trolls being the second roleplaying game ever, the majority of material created for the system is made by small press publishers like my own. 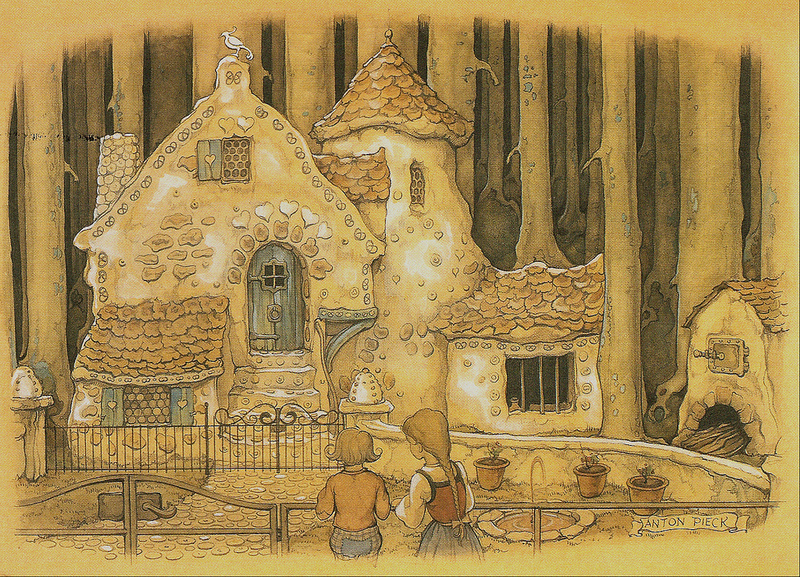 In fact, in the scheme of RPGs T&T is one of the more obscure (criminally so). Despite this, the game has enjoyed great support over in Japan where it was actually released before D&D (I believe the same goes for the UK through Corgi publishing). The most prominent publisher of T&T material in the land of the rising sun is SNE, who produced the localised Deluxe T&T, a series of adventures and T&T Adventures Magazine, which includes solos, GM adventures and manga. This is all genuinely high quality stuff with its own art, including Kiyoshi Arai (Final Fantasy VII). Earlier this year T&T Adventures was released for the first time in English, complete with original manga plus some Steve Crompton illustrations. 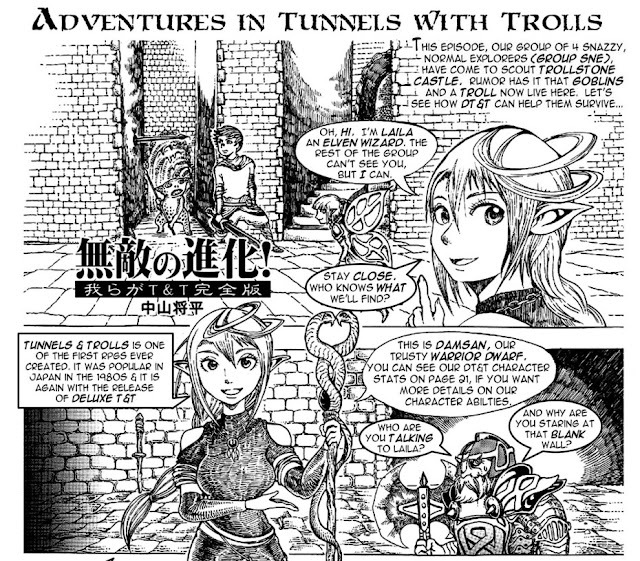 T&T Adventures is an introduction to the game with examples told through some light-hearted manga antics starring a dwarf warrior, human rogue, elf wizard and fairy wizard. It's a nice little explainer that leads into a few pages of mini rules and a short spell list. Rather than using the classic racial multipliers, the mini rules give you bonuses to add. It's not a bad idea actually, though it means you're less likely to get the swingy attributes we all know and love. That said, it gives you everything you need to get started and I kind of love it. After the rules we get into the adventures. First up we have Kitten-napped, where the PCs have to become tiny animals to save a little girl from a troll. Yeah, it's manga-licious and beginner friendly. The Secret Order of the Eye is the solo adventure, which has a pretty cool innovation where NPCs will change their reactions towards you as the adventure goes on. It's something I've not seen in a solo before. Journey to the Black wall Street is the final GM adventure in the book, which is followed by some more manga to close everything out. If you want to introduce a newbie to T&T, give them this. It really is everything they need and more, complete with manga that both brings the rules to life and provides veterans with a fresh perspective on the game. Images: Group SNE/ Flying Buffalo Inc. 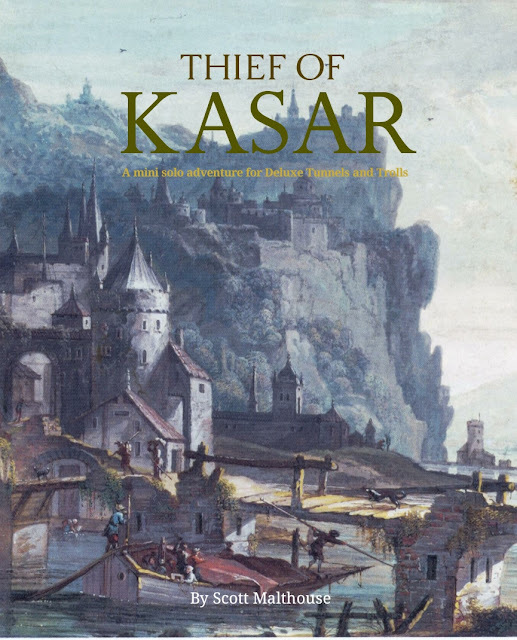 I've just released my new mini solo for Deluxe T&T - Thief of Kasar, which you can download as a pay what you want PDF. Kasar is a city of corruption and riches, and a place a thief for hire can make a pretty penny if they know who to seek out. Fortunately for you the job has found you, but it'll take all you skills to steal back a magical talisman. 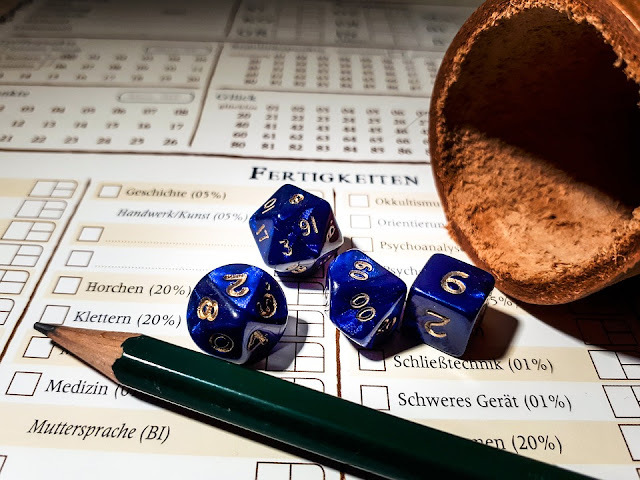 As can be expected at the release of a new playtest, there's a tonne of theorising on the internet about how Pathfinder 2nd edition plays but far fewer people actually playing the game. My group took a weekend in the first week of release to launch our first foray into the ruleset and we've continued the Doomsday Dawn adventure over Roll20, so we have a pretty good grasp of how the game actually plays. As a bit of background, I've been kicking it in Golarion for around five years now so I'm more than familiar with Pathfinder and what constitutes the game. That said, what follows isn't just a comparison to that game. I want to treat the new edition on its own merits. That said, there is clear inspiration found here from other games, so I'm going to talk about that. As you'd expect in a brand spanking new edition, there are changes (though no 4e paradigm shifts) - for better and worse, but that's the entire point of a playtest, right? Take resonance for example. Charisma has become magic item fuel (why? Not sure) in the form of resonance points. You need these to use magic items, which includes swigging a potion. This rule obviously limits the number of magic trinkets, weapons and whatnot you can use at a time - perhaps inspired by 5e's attunement rules. So far in our games, this hasn't presented an issue and it's probably a fair limitation. A rule, however, that will crop up time and again for obvious reasons is initiative. This is now based on what you're doing at the time that the encounter starts. Are you sneaking? Roll stealth for initiative. Tracking? 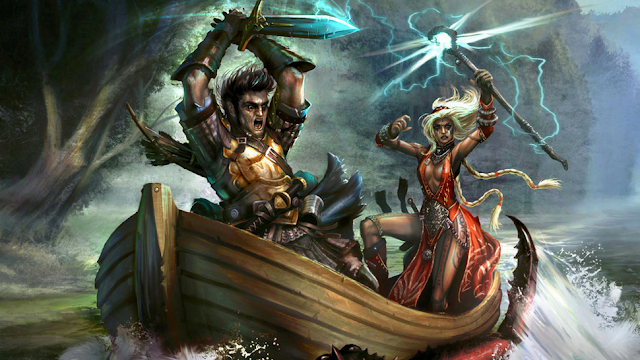 Roll survival. Most of the time you'll be rolling perception, which is fine. In our games this has generally been fine and it's a nice way of getting players to think about what they're doing during exploration (which is now he highlighted as a distinct 'mode'). It caused a few issues with stealth (they had a glowing bear at one point, which kind of detracts from the stealth angle). Overall, fine. I'll tell you what's a real improvement, though. The action economy. You get three actions - any action. Want three attacks? Have them, but with penalties to each subsequent attach. Move twice, raise your shield. Attack, move, grapple. For our group the action economy is by far the best element of the game so far as we're finding it keeps combat fluid. Not having attacks of opportunity being a universal rule (it's now a fighter thing) makes combat a bit less of a chore. But, with a wider variety of bespoke monster reactions, you still have to second guess whether an enemy you're pulling away from might smack you good with something. And believe me, if you have a magic weapon you'll be smacking real good. A +1 weapon now adds an extra damage die, meaning a +1 greataxe is 2d12, critting with 4d12. In Doomsday Dawn it's possible to have this very early on. What's more is that crits now happen by getting 10+ over your target, so low AC is punishing. I should know - I played a barbarian at one point and I got utterly decimated a lot, but I also dealt crazy damage (magic greataxe and rage). Speaking of AC, the new design makes everyone pretty much end up with the same. You could take a swingy-as-hell system as a positive or negative (I quite like swingy), but something I've found to be a real positive is the proficiency system, which allows you to become trained, expert, master etc in skills, weapons and armour. There are no skill points - you can upgrade from trained to expert in a skill for a set bonus. Clean and simple. Something that seems clean and simple, but I've not really made up my mind about yet is the ability score creation. Rolling isn't the default anymore - instead every ability starts at 10 and you get bonuses from your class, background and ancestry (race), plus some free ones. You basically end up with an array, which is fine but we found that the order to do this presented in the book was a little confusing. Let's get one thing straight. Magic items as presented in the playtest are pretty humdrum. There's nothing weird or particularly interesting, but I do give them kudos for not making everything about combat. I'd love to see items that are a bit more imaginative. 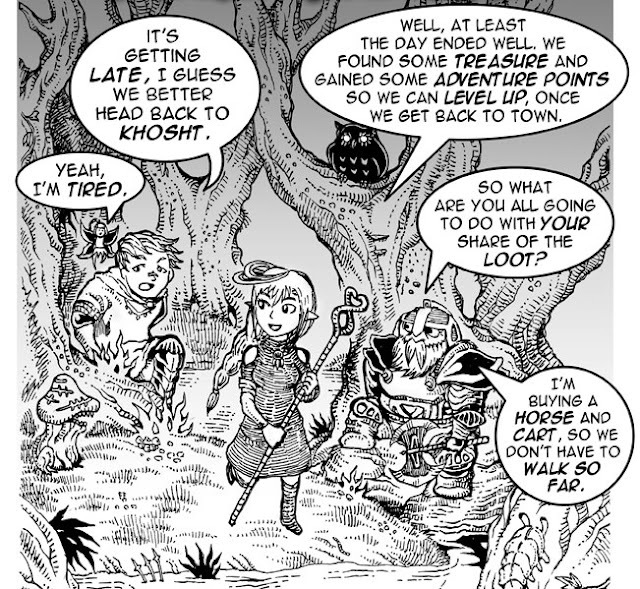 Right now there's a clear imbalance in classes, with rogues getting a lot of love and rangers being just plain dull. The problem with the ranger is that they will generally have one class feat from the selection that far outshines the others, so that's what people will go with. Barbarians are still pretty cool, but as I said before the new crit system is not kind to them. I know, I know, I'm not actually a fan of game balance (T&T fan over here), but since Pathfinder is more combat oriented, it's needed moreso. Ultimately, we're enjoying the playtest. While we recognise classes aren't yet up to snuff and perhaps the feats are a little bit on the game side, the action economy and streamlined skills system do make things cleaner. Pathfinder will never be my favourite system, but cutting back on the bloat of the first edition can only be a good thing. The swamp of Zzozz is the eventual dumping ground for spend potions used by Vincher's College of Wizarding in nearby T'wux. As a result, the swamp water is not only fetid - it's seeped in all kinds of magical garbage, which has somewhat of an adverse effect on local flora and fauna. Here are their stories. Chung chung. 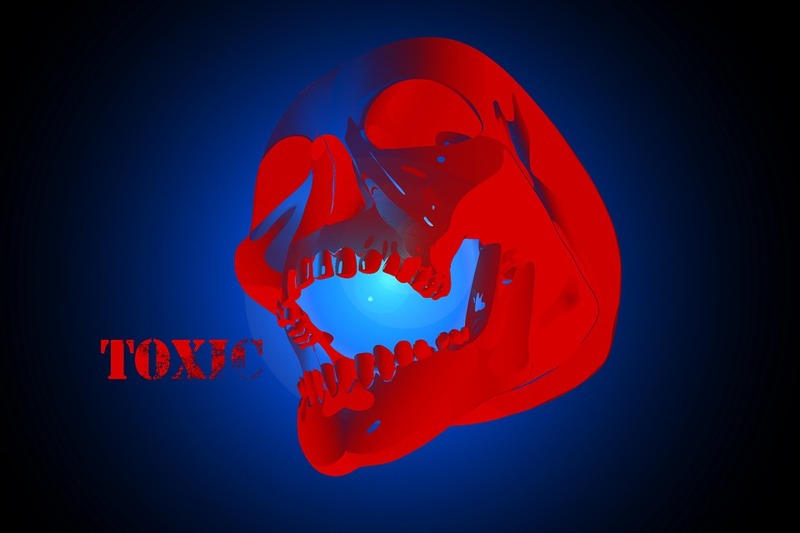 Spite: 2/ Toxic Vom: The skeleton vomits luminous green bile into the eyes of the nearest opponent. The target must succeed a L2SR-DEX or LK or become blinded for 1d3 rounds. While blinded they do not include their adds in attacks. With its flesh sloughing off its bones, this reanimated body of a lost adventurer loves to chuck up on the things it attacks while screaming in agony. Spite: 3/ Ultra ray: The bat rears up and fires a red ray from its eyes at a random opponent. They must succeed a L2SR-DEX or LK or be fried for a further 2d6 damage and temporary reduce STR by 2. These giant yellow bats have rayguns for eyes and mouth full of razor teeth. Their eyes make an authentic 'pew pew' sound. Spite: 4/ Heat coil: the rat mamba wraps around a random opponent. They must succeed a L4SR-STR or become squeezed and burnt, taking 4d6 damage and being unable to move for 1d6 rounds. Created as a large mamba snake was eating it's rodent prey, the rat mamba is everything awful about both creatures plus the ability to increase its body temperature to ridiculous levels. The rat mamba is also a popular dance on the planes of Whelp, but that's a different thing entirely. Spite 3/ Terror: The reaping Willow changes its form into that which the observer is most terrified. All who are looking at it must make a successful L3SR-INT or break down into gibbering wrecks for 1d4 rounds. During this time they can only cry and rock back and forth. 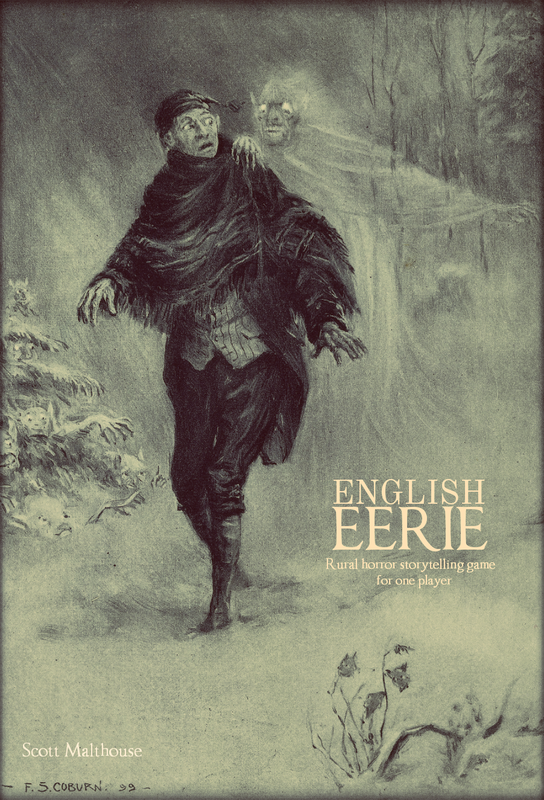 Seasons don't fear the reaper, but pretty much every poor sod who comes across one does. The Reaping Willow looks like an ordinary willow, aside from its hidden red eyes on its trunk. It can transform into someone's worst fears - like ogres or taxes. Before I begin, I'm obviously not including any of my own games in here. That would be super un-British of me. Also, I've been informed that there are quite a few games out there, some say there could be more than eleven games! I've not played them all. These are just the favourite of those that I've played, obviously. If you've been following Trollish Delver over the past nine years, you'll know how much I love T&T. In fact my last few posts have been all about it. For those who don't know, T&T is the second roleplaying game and a response to the percieved complexity of the original D&D rules. Created by Trollgod Ken St. Andre, T&T eschewed the wargame-derived combat for something more abstract and simple. It also introduced a ridiculous slew of weapon types to choose from and peppered the game with humour where D&D may have been a bit more po-faced. 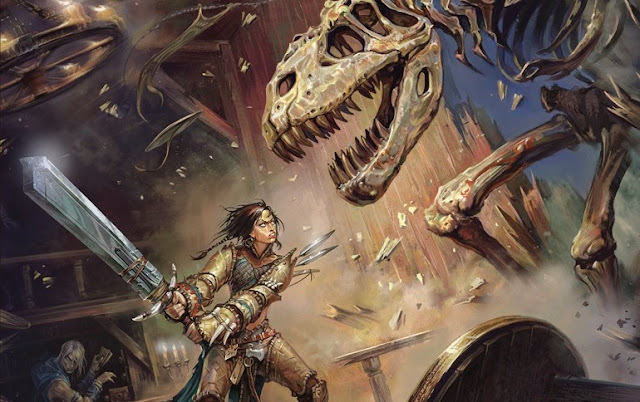 For me, the best part is the proliferation of solo adventures for the system, meaning you can take a character on a solitary campaign, from the crucible of Buffalo Castle, through the Arena of Khazan and beneath Blue Frog Tavern. To T&T enthusiasts, places like Gull, Kasar and Khosht are as iconic as Waterdeep, Baldur's Gate or Blackmoor. My personal favourite is 5th edition, with house rules inspired by 7e and Deluxe - but most editions are compatible. Cosmic horror is my literary jam and Chaosium's Call of Cthulhu is, for me, the definitive Lovecraftian game. The BRP system is simple to grasp but robust, leading to a great roleplaying experience. Some of the best games I've run have been CoC, with a slow-burning horror, cosmic horrors that can't be defeated and the players' spiral into insanity. Don't expect to survive an adventure - most PCs end up either dead or in an institution. This is my favourite flavour of D&D. Simple, race-as-class, roll-under, deadly. I think the OSR lives in the imagination and White Box really encourages creative thinking because turns are quick and efficient. PCs don't have a slew of powers at their disposal and they're not superheroes. It's simply a game you can read in an afternoon and get down to playing at the table. That said, I also love games like The Black Hack and Lamentations of the Flame Princess for these reasons. Despite never really being a fan of things like Watership Down and Animals of Farthing Wood, Tales from the Wood by Simon Washbourne (Barbarians of Lemuria) captivated me and was an inspiration for my own games. 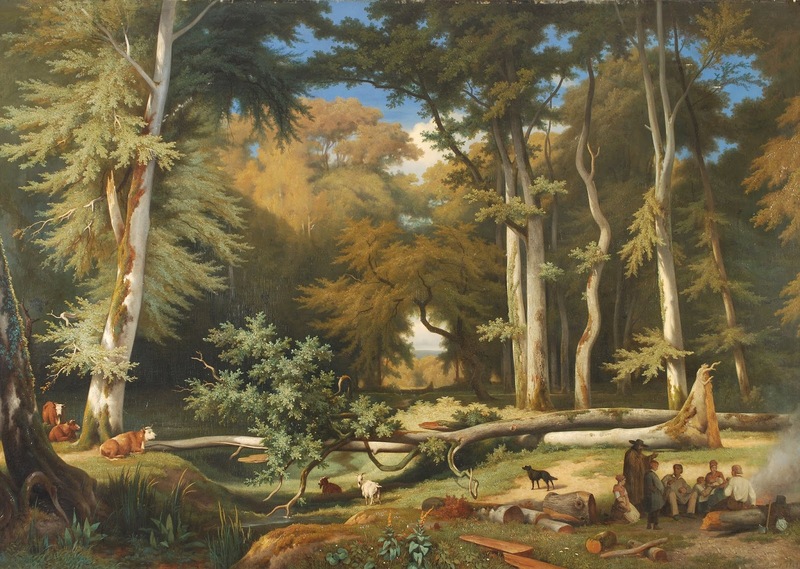 Tales from the Wood is about woodland animals of the British countryside essentially trying to survive this tooth and claw world. The rules are simple and there's a cool mythology woven into the game. Oh, and you're not anthropomorphic animals - you're real animals - no weird clothing needed. Oh, Scott, what a boring pick. Yeah, sure, it might be, but in my eyes 5e is the most recent version of the rules I can really get behind. After 4e, which I thought was great at what it did, but broke at higher levels, 5e took a step back to assess the philosophy of what D&D truly was, even bringing along OSR-famed consultants to advise. What we got at the end was a great, pared back rules set that pushed roleplaying more to the forefront than the last few editions. Is this one for crunchy powergamers? No, not at all. The crazy amount of character options you get with the likes of Pathfinder aren't there, but the trade-off is an elegant set of mechanics and a nod to old school gaming. 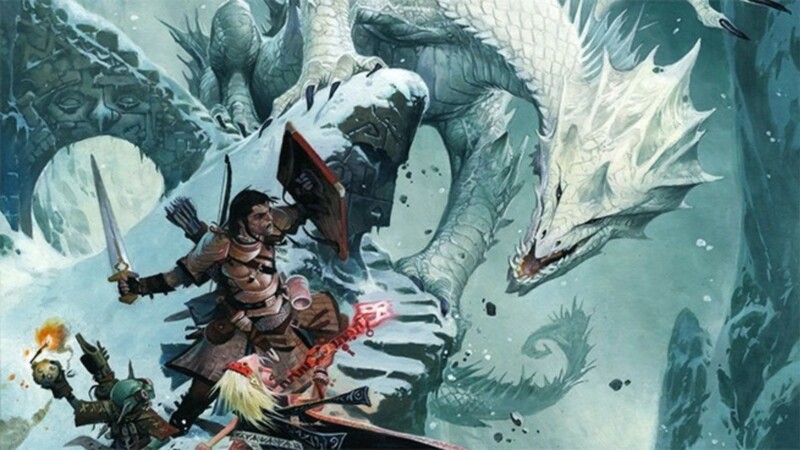 For me, it's everything I want from a new D&D game. Earth people are unlike anything else on Mars. Their strength is heightened by the Martian gravity, allowing them to take on a Warhoon in single combat and leap 30ft in the air with ease. Mighty leap: You can leap huge distances. Make an action test (easy). For every 1 you roll over the target, you can leap 10ft. The predominant Martian race, the 'reds' have coppery skin and wear little attire save for jewels and some silks. Aristocrats are close to the ruling Jed of Helium, rich and usually powerful. Ruling Class: You hold sway due to your status. When attempting to persuade a fellow red martian, you may re-roll and take the highest. The green-skinned tharks are one of the mighty warrior races on Mars. 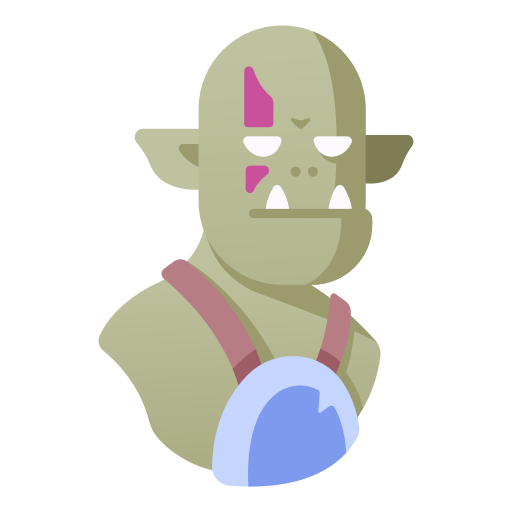 Their four arms and facial tusks make them an imposing people, but in combat they are a force to be reckoned with. Deadly Force: You do +1 damage in melee combat. The Black Martians were the first born on Barsoom, with narrow eyes and polished ebony skin. The pirates pilot great ships, capturing There's and red Martians before enslaving them in the name of their goddess Issus. Dervish: When using a bladed weapon, you can make a secondary attack at -2.